Happy Caturday, and forgive today’s selection—the third feline featured in this series (see Days 38 and 51 for the others). Consider self-titled “Oskar Running in the Snow I” as a gift to my wife, who celebrated a birthday yesterday. She loves kitties. 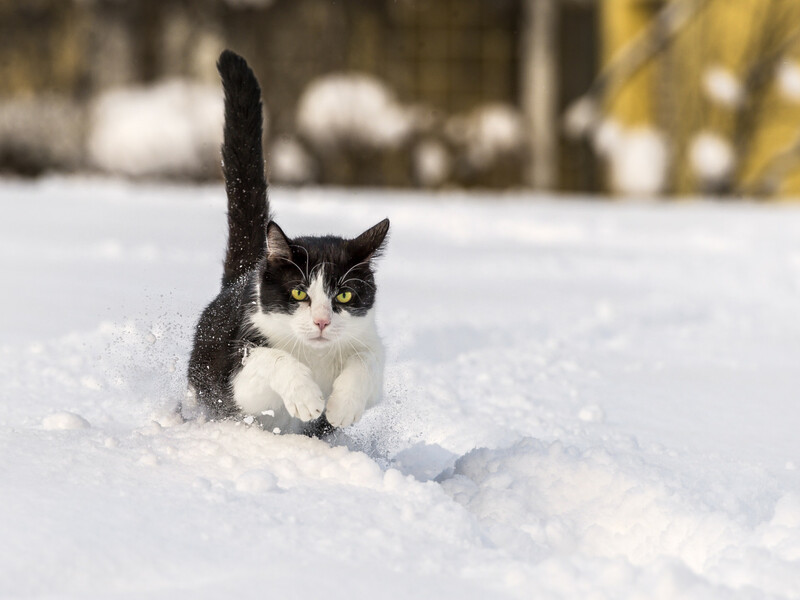 Emmanuel Keller captured Oskar on Feb. 9, 2013, using Nikon D4 and 70-200mm f/2.8 lens. Vitals: f/5, ISO 250, 1/1250 sec, 200mm. There are four other pics in the series, and I almost picked IV for the snow spray but favored the first for composition (and Creative Commons licensing). Both equally appeal to me (and hopefully to you, too). Another I liked less but still considered is from a February 2015 shoot. All three images are among more than 200 featured in Emmanuel’s “Domestic Cats” album. If you love the furballs, stop reading and click through to see them. My artistic and online Tambako name has to do with my love for big cats. In particular, the elegant Jaguars fascinate me. Of this genus, a large part lives in the Amazon region. There is a place called tambaqui, and it was Tambako…My favorite subjects are animals, especially big cats. I can spend hours waiting for the right moment to capture their majesty and strength in the image. Animals of all varieties—not just cats—dominate his photostream. His work is fantastic. Open Emmanuel’s Flickr and expect to be taken on a National Geographic expedition. He joined Flickr in June 2007 and remains very active 8 years later.